What Did the Long-necked Plesiosaurs Use Their Necks For? Home/Dinosaur and Prehistoric Animal News Stories, Dinosaur Fans, Main Page, Photos/Pictures of Fossils/What Did the Long-necked Plesiosaurs Use Their Necks For? The long-necked Plesiosaurs (Plesiosauroidea), are characterised (unsurprisingly), by their long necks, which in the case of the elasmosaurids were taken to extremes with some Late Cretaceous species having necks around seven metres in length, comprising 76 cervical vertebrae, but how did these marine reptiles use their necks? What degree of movement did these long necks have? These are questions that have been debated by palaeontologists for nearly two hundred years. New research, published this week by the Royal Society, sheds light on the flexibility and neck movement in one Plesiosaur, the Early Cretaceous leptocleidid Nichollssaura borealis. Superbly preserved Plesiosaurus fossil – the type specimen of Nichollssaura borealis in dorsal view. The Plesiosauria clade was very successful, originating in the Triassic and persisting until the very end of the Cretaceous. This clade is split into three distinct groups, although palaeontologists debate the phylogeny between the Plesiosauria clade members. The Plesiosauroidea – the long-necked marine reptiles, epitomised by short tails, broad bodies, four flippers, a small head and an elongated neck. The Pliosauridae – the short-necked Plesiosaurs, with large heads, broad bodies, four flippers and much shorter necks than the Plesiosauroidea. The Rhomaleosauridae – a sort of half-way house between the other two, typically possessing longer necks and smaller heads relative to the Pliosauridae, but have shorter necks and larger heads when compared to members of the Plesiosauridae. Most known rhomaleosaurids are confined to the Early to Middle Jurassic of Europe, with most specimens assigned to this group having been found in England. 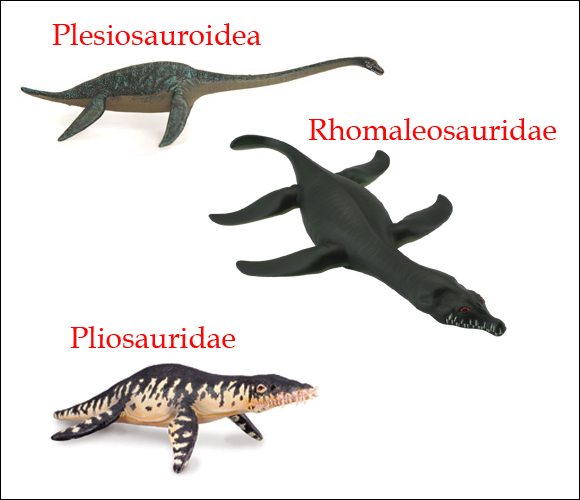 The three groups that make up the Plesiosauroidea. The long-necked Plesiosauroidea, the short-necked Pliosauridae and the Rhomaleosauridae. The researchers from the Royal Tyrrell Museum and the University of Calgary, focused their study upon one specimen, a member of the Plesiosauroidea called Nichollssaura borealis. This specimen was chosen as it represents a very nearly complete individual and the fossil is not distorted or crushed to any degree which might have comprised any research into neck flexibility. There were two further, more practical reasons why N. borealis was selected. Firstly, the specimen is housed at the Royal Tyrrell Museum and since one of the researchers involved in the study was Donald Henderson, a curator at the museum, accessing the specimen was not a problem. In addition, with a total length of 2.6 metres Nichollssaura could squeeze into the medical CT scanner that was being used to create accurate three-dimensional images of the bones. Once the specimen had been CT scanned, the subsequent three-dimensional models that were produced could be examined so as to conclude the range of movement afforded by the 24 bones in the neck of this Plesiosaur (24 cervical vertebrae). Examining the range of motion of Nichollssaura. When the three dimensional models of the Nichollssaura borealis neck were examined the scientists discovered that the neck of this Plesiosaur was indeed very mobile, but their results suggest a preference for lateral (sideways) movements of the neck in this species. This supports the idea that these marine reptiles fed in or along the seafloor, using their small heads and long necks to probe into the sediment to find invertebrates and fish. Unfortunately, no gut contents indicating potential prey have been preserved in association with the single fossil specimen of Nichollssaura, however, other researchers have found prey gut contents in other plesiosaurids that supports the idea that these animals fed by disturbing and catching animals that live on the sea floor (epifaunal). To test the validity of the three-dimensional computer models, the scientists studied the range of neck movement in a extant species of monitor lizard, Dumeril’s monitor, a species from south-east Asia (Varanus dumerilii). This species was chosen as it has a relatively long neck for a monitor lizard and a preserved specimen was available for study. The researchers conclude that if this species of plesiosaurid (N. borealis) had a neck that was adapted to rapid sideways movements then this probably evolved in relation to feeding method and prey capture. Different types of Plesiosauroidea with their different neck lengths very likely had different ecological roles within the ecosystem. This study also demonstrates that three-dimensional modelling is an effective tool for assessing function morphology for structures where no good, living analogue for comparison exists.